The shaded area in the following graph indicates the area to the left of x. This area is represented by the probability P(X < x). Normal tables, computers, and calculators provide or calculate the probability P(X < x). To calculate the probability, use the probability tables provided in [link] without the use of technology. The tables include instructions for how to use them. For this problem: normalcdf(65,1E99,63,5) = 0.3446. You get 1E99 (= 1099) by pressing 1, the EE key (a 2nd key) and then 99. Or, you can enter 10^99 instead. The number 1099 is way out in the right tail of the normal curve. We are calculating the area between 65 and 1099. In some instances, the lower number of the area might be –1E99 (= –1099). The number –1099 is way out in the left tail of the normal curve. The TI probability program calculates a z-score and then the probability from the z-score. Before technology, the z-score was looked up in a standard normal probability table (because the math involved is too cumbersome) to find the probability. In this example, a standard normal table with area to the left of the z-score was used. You calculate the z-score and look up the area to the left. The probability is the area to the right. Area to the left is 0.6554. The answer is 0.3999 which rounds to 0.4. The probability that one student scores less than 85 is approximately one (or 100%). c. Find the 90th percentile (that is, find the score k that has 90% of the scores below k and 10% of the scores above k). c. Find the 90th percentile. For each problem or part of a problem, draw a new graph. Draw the x-axis. Shade the area that corresponds to the 90th percentile. Let k = the 90th percentile. The variable k is located on the x-axis. P(x < k) is the area to the left of k. The 90th percentile k separates the exam scores into those that are the same or lower than k and those that are the same or higher. Ninety percent of the test scores are the same or lower than k, and ten percent are the same or higher. The variable k is often called a critical value. d. Find the 70th percentile (that is, find the score k such that 70% of scores are below k and 30% of the scores are above k). The 70th percentile is 65.6. This means that 70% of the test scores fall at or below 65.5 and 30% fall at or above. a. Let X = the amount of time (in hours) a household personal computer is used for entertainment. X ~ N(2, 0.5) where μ = 2 and σ = 0.5. 80% of the smartphone users in the age range 13 – 55+ are 48.6 years old or less. To find the 30th percentile, find k such that P(x < k) = 0.30. Find k1, the 40th percentile, and k2, the 60th percentile (0.40 + 0.20 = 0.60). c.	Find the 90th percentile for the diameters of mandarin oranges, and interpret it in a complete sentence. 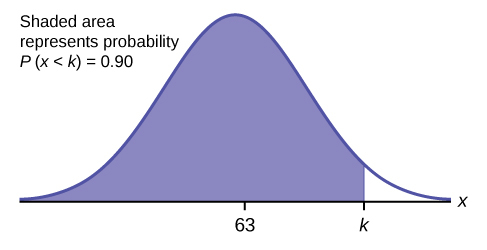 Find k1, the 30th percentile and k2, the 70th percentile (0.40 + 0.30 = 0.70). 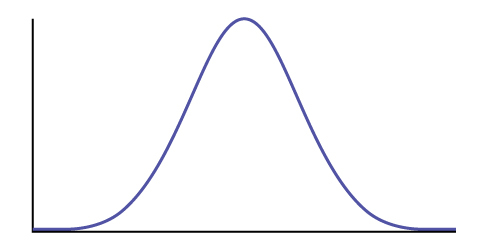 The normal distribution, which is continuous, is the most important of all the probability distributions. Its graph is bell-shaped. This bell-shaped curve is used in almost all disciplines. Since it is a continuous distribution, the total area under the curve is one. The parameters of the normal are the mean µ and the standard deviation σ. A special normal distribution, called the standard normal distribution is the distribution of z-scores. Its mean is zero, and its standard deviation is one. 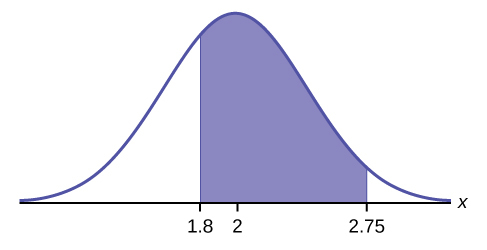 Normal Distribution: X ~ N(µ, σ) where µ is the mean and σ is the standard deviation. Is P(x < 1) equal to P(x ≤ 1)? Why? Use the following information to answer the next three exercise: The life of Sunshine CD players is normally distributed with a mean of 4.1 years and a standard deviation of 1.3 years. A CD player is guaranteed for three years. We are interested in the length of time a CD player lasts. Find the probability that a CD player will break down during the guarantee period. Find the probability that a CD player will last between 2.8 and six years. The 90th percentile for recovery times is? Based upon the given information and numerically justified, would you be surprised if it took less than one minute to find a parking space? and justify your answer numerically. The probability that a person has an IQ greater than 120 is 0.0918. A person has to have an IQ over 130 to qualify for MENSA. The middle 50% of IQ scores falls between 89.95 and 110.05. The percent of fat calories that a person in America consumes each day is normally distributed with a mean of about 36 and a standard deviation of 10. Suppose that one individual is randomly chosen. Let X = percent of fat calories. The probability that a person consumes more than 40% of their calories as fat is 0.3446. Approximately 25% of people consume less than 29.26% of their calories as fat. The probability that a fly ball travels less than 220 feet is 0.2743. Eighty percent of the fly balls will travel less than 292 feet. In China, four-year-olds average three hours a day unsupervised. Most of the unsupervised children live in rural areas, considered safe. Suppose that the standard deviation is 1.5 hours and the amount of time spent alone is normally distributed. We randomly select one Chinese four-year-old living in a rural area. We are interested in the amount of time the child spends alone per day. X = number of hours that a Chinese four-year-old in a rural area is unsupervised during the day. The probability that the child spends less than one hour a day unsupervised is 0.0918. The probability that a child spends over ten hours a day unsupervised is less than 0.0001. In the 1992 presidential election, Alaska’s 40 election districts averaged 1,956.8 votes per district for President Clinton. The standard deviation was 572.3. (There are only 40 election districts in Alaska.) The distribution of the votes per district for President Clinton was bell-shaped. Let X = number of votes for President Clinton for an election district. This is a population mean, because all election districts are included. The probability that a district had less than 1,600 votes for President Clinton is 0.2676. Seventy-five percent of the districts had fewer than 2,340 votes for President Clinton. The probability that a randomly selected trial will last more than 24 days is 0.3336. Terri Vogel, an amateur motorcycle racer, averages 129.71 seconds per 2.5 mile lap (in a seven-lap race) with a standard deviation of 2.28 seconds. The distribution of her race times is normally distributed. We are interested in one of her randomly selected laps. Terri completes 55.17% of her laps in less than 130 seconds. If only ten customers has been surveyed rather than 50, do you think the answers to part f and part g would have been closer together or farther apart? Explain your conclusion. The cumulative frequency for less than 6.1 minutes is 0.64. The answers to part f and part g are not exactly the same, because the normal distribution is only an approximation to the real one. The answers to part f and part g are close, because a normal distribution is an excellent approximation when the sample size is greater than 30. The approximation would have been less accurate, because the smaller sample size means that the data does not fit normal curve as well. Suppose that Ricardo and Anita attend different colleges. Ricardo’s GPA is the same as the average GPA at his school. Anita’s GPA is 0.70 standard deviations above her school average. In complete sentences, explain why each of the following statements may be false. If the average GPA is less at Anita’s school than it is at Ricardo’s, then Ricardo’s actual score could be higher. the average for his school, which is typically a passing GPA. Anita’s percentile is higher than the 70th percentile. [link] shows a sample of the maximum capacity (maximum number of spectators) of sports stadiums. The table does not include horse-racing or motor-racing stadiums. Calculate the sample mean and the sample standard deviation for the maximum capacity of sports stadiums (the data). Let the sample mean approximate μ and the sample standard deviation approximate σ. The distribution of X can then be approximated by X ~ _____(_____,_____). Determine the cumulative relative frequency that the maximum capacity of sports stadiums is less than 67,000 spectators. Hint: Order the data and count the sports stadiums that have a maximum capacity less than 67,000. Divide by the total number of sports stadiums in the sample. The cumulative relative frequency is 43/60 = 0.717. An expert witness for a paternity lawsuit testifies that the length of a pregnancy is normally distributed with a mean of 280 days and a standard deviation of 13 days. An alleged father was out of the country from 240 to 306 days before the birth of the child, so the pregnancy would have been less than 240 days or more than 306 days long if he was the father. The birth was uncomplicated, and the child needed no medical intervention. What is the probability that he was NOT the father? What is the probability that he could be the father? Calculate the z-scores first, and then use those to calculate the probability. P(240 < x < 306) = P(–3.0769 < z < 2) = normalcdf(–3.0769,2,0,1) = 0.9762. According to the scenario given, this means that there is a 97.62% chance that he is not the father. A NUMMI assembly line, which has been operating since 1984, has built an average of 6,000 cars and trucks a week. Generally, 10% of the cars were defective coming off the assembly line. Suppose we draw a random sample of n = 100 cars. Let X represent the number of defective cars in the sample. What can we say about X in regard to the 68-95-99.7 empirical rule (one standard deviation, two standard deviations and three standard deviations from the mean are being referred to)? Assume a normal distribution for the defective cars in the sample. z = ±1: x1 = µ + zσ = 10 + 1(3) = 13 and x2 = µ – zσ = 10 – 1(3) = 7. 68% of the defective cars will fall between seven and 13.
z = ±3: x1 = µ + zσ = 10 + 3(3) = 19 and x2 = µ – zσ = 10 – 3(3) = 1. 99.7% of the defective cars will fall between one and 19. There is about a 68% chance that the number of heads will be somewhere between 16 and 24. z = ±1: x1 = µ + zσ = 20 + 1(4) = 24 and x2 = µ-zσ = 20 – 1(4) = 16. There is about a 99.73% chance that the number of heads will be somewhere between eight and 32. For this problem: normalcdf(8,32,20,4) = 0.9973 = 99.73%. Facebook provides a variety of statistics on its Web site that detail the growth and popularity of the site. X = the percent of 18 to 34-year-olds who check Facebook before getting out of bed in the morning. invNorm(0.95,0.28,0.05) = 0.3622.95% of the percent of 18 to 34 year olds who check Facebook before getting out of bed in the morning is at most 36.22%. P(25 < x < 55). Using the Normal Distribution by OpenStaxCollege is licensed under a Creative Commons Attribution 4.0 International License, except where otherwise noted.